The nerve system controls and coordinates every function of every cell in the body. The only structure that protects the nerve system is the vertebral column (spine). If the vertebrae (bones of the spine) are out of normal position, they will interfere with the nerve system’s ability to function. Chiropractic’s purpose is to keep those vertebrae in proper alignment. Since everything you experience in life (smell, touch, taste, hear, etc.) 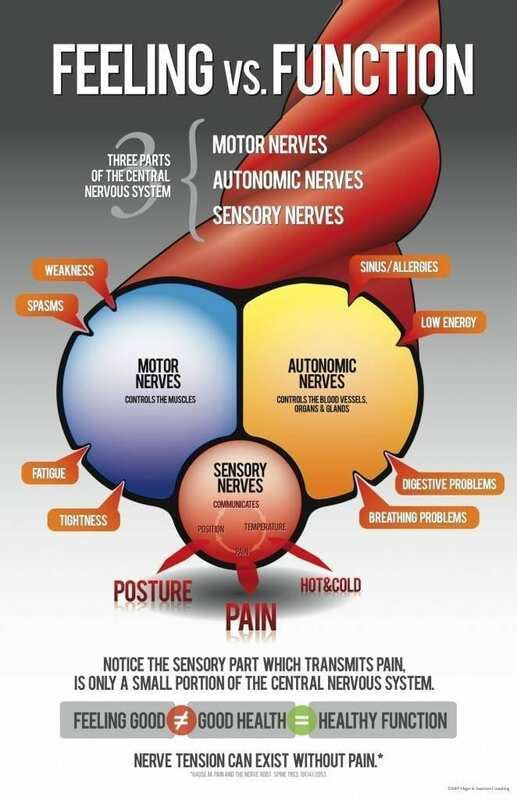 is done so through the nerve system, chiropractic will enhance the life you experience! In the same manner, everything that you express in life (thoughts, actions, emotions, etc.) is done so through the nerve system. Therefore, chiropractic will enhance your life expression! Chiropractic is not about your pain. Chiropractic is not about your back. Chiropractic is about your LIFE!